First-half goals from Conor McDermott and Ronan Curtis helped Derry City to a 2-1 win over Drogheda United in Friday night's Premier Division game. McDermott took advantage of poor defending to slide the ball into the net in the third minute and Curtis toe-poked home the second after 14 minutes. Substitute Mark Doyle grabbed a last-gasp consolation but the result confirmed his side's relegation. Derry remain in the fourth spot which would guarantee a Europa League place. Kenny Shiels' side are one point adrift of third-placed Shamrock Rovers and four ahead of Bray Wanderers below them. The Candystripes' hopes of European qualification had taken a dent with a demoralising 5-0 defeat by Bray Wanderers at Maginn Park last week but they are now well placed with four games to go. Their next match is at home to Finn Harps on Friday 13 October. 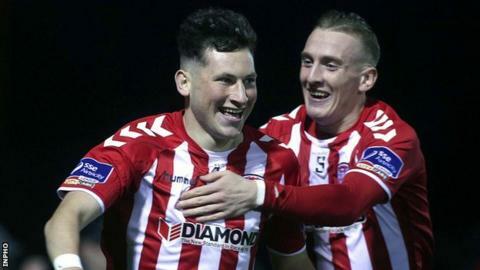 Derry had beaten the Drogs 4-0 in the league earlier in the season and a repeat of that scoreline looked to be on the cards when McDermott opened the scoring early on with his first goal for the club. McDermott then turned provider, squaring the ball for Curtis to find the net after a swift counter-attack by the home side. In the second half, Stephen McGuinness saved well from Harry Monaghan and Barry McNamee saw his effort come off the inside of the post. Aaron Barry almost skewed the ball into his own net and Ger Doherty was forced into a fine save, before finally being beaten by Doyle in the closing moments. Read more on What happened in the Premier League?